On Saturday, the UN rep met with dozens of homeless people — many disabled, elderly, veterans, chronically ill, and suffering from addictions. 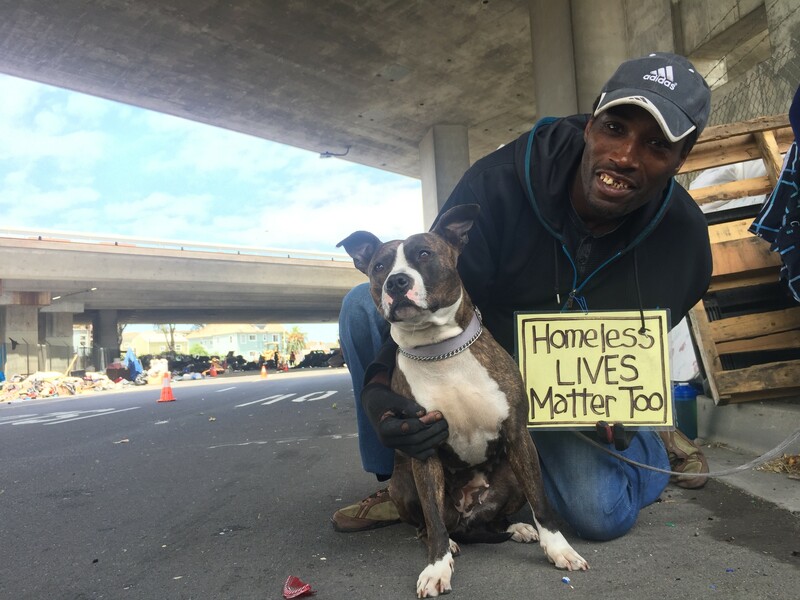 Shawn Moses at the Northgate homeless encampment last May, along with his dog Princess. United Nations Special Rapporteur on Adequate Housing Leilani Farha inspected Oakland's homeless encampments on Saturday during an unofficial research assessment. Afterward, she told the Express in an interview that she observed conditions of "systemic cruelty." Farha, who was appointed to the independent expert position by the UN Commissioner for Human Rights in 2014, has previously examined housing conditions in Jarkarta, Manila, and most recently Mexico City. Her current mission is focused on informal settlements and camps in major metropolitan regions across the global north and south. While homelessness is an international crisis, in several respects, she said, the situation in California's cities is worse than other parts of the world. "I find there to be a real cruelty in how people are being dealt with here," she said. The rapporteur was concerned also about the scale of Oakland's homeless crisis. "Everywhere we've driven today, I've seen camps," she said. Oakland's homeless population is conservatively estimated at 2,761. Over 300 of the homeless people counted last year during a county census were children, and 68 percent of the city's homeless are Black. Most of the homeless have chronic health problems. Some are employed but can no longer afford the cost of housing in the Bay Area. Farha clarified that she didn't meet with local government leaders and therefore hasn't been briefed on what plans they have to address the shelter crisis. In fact, her visit was purposefully not announced so as avoid media and government attention. She also said she was not judging the government's response on behalf of the UN. Rather, her visit was purely to gather information. But she said that what she observed, including Oakland's newest policies like the city-sanctioned Tuff Shed camp, should only be considered temporary and partial measures and that Oakland and other cities with large and growing homeless populations have an obligation under international law to do much more, immediately. Farha pointed to the lack of access to clean water and toilets, rodent infestations, fire dangers, and other hazards as conditions that should be quickly addressed. Similar conditions exist in San Francisco, San Jose, Sacramento, Fresno, Los Angeles, San Diego, and California's other major cities. Farha's next stop is Los Angeles. While she acknowledged Oakland's effort to place portable toilets at some camps in the city, she said this did not appear to be meeting the needs of camp residents. For example, the Wood Street camp in West Oakland has approximately 75 residents but only one portable toilet that's infrequently serviced. Most camps do not have access to running water. "Imagine being a woman who is menstruating and having to go into one of the porta-potties," she said. While Farha said that the numbers of unsheltered people has grown in other cities around the world, the situation in California is made much worse due to laws that effectively criminalize homelessness. She pointed to laws in some cities against sleeping in vehicles and camping and against sitting or lying on sidewalks. Many other cities in places like Mexico or the Philippines either do not have strict anti-homeless laws, or they're not systematically enforced in a manner that harasses unsheltered people. Their existence is tolerated by the government and the rest of society, whereas in California the homeless are often treated as an inconvenience to be moved along. City of Oakland officials and agencies like Caltrans have said that they have no choice but to periodically make camps move so that areas can be cleaned and sanitized. Officials worry about hepatitis outbreaks or other dangers, in addition to mountains of garbage that build up near the camps. (Most of the illegal dumping in Oakland comes from homes and construction companies and is not produced by the camps.) And city residents and business owners often complain when homeless camps in their neighborhoods and near their businesses grow. But this repeated forced movement, coupled with the absence of a realistic pathway back to stable housing, is what Farha said is "systemically cruel" about the plight of the homeless in the state. She also questioned why a wealthy state like California hasn't spent sufficient funds to address the homelessness crisis. In fact, the crisis has only worsened during the most recent seven-year economic boom. A small percentage of society has been enormously enriched while large numbers of people have been displaced from their homes and the homeless camps have grown. "In Mexico City, I visited a low-income settlement that had been moved by the city onto empty land near a railway line,” she said. "They had no running water. They stole electricity." The camp was noisy and dangerous. She noted that the camp in Mexico is virtually identical to those she visited in Oakland, including the Wood Street and 23rd Avenue encampments. She questioned why Oakland and other California cities are not doing more to house the thousands of unsheltered people. The Bay Area is home to some of the wealthiest companies in the world including Apple, Facebook, Google, Wells Fargo, and Chevron. And the Bay Area's real estate wealth has dramatically grown over the past ten years. But state anti-tax laws like Prop. 13 effectively block cities like Oakland from taxing that wealth to create more affordable housing. In reports, Farha has written that governments increasingly treat housing as a commodity to create profits rather than as a social good to fulfill people's needs. Farha described it as the "dehumanizing" of housing. "What is so stark about the pouring of those vast amounts of money into housing is that hardly any of it is directed towards ameliorating the insufferable housing conditions in which millions live," she wrote in a recent paper. In Oakland, only 6 percent of the housing under construction is subsidized to be affordable. The rest is market-rate housing which could alleviate overall housing prices in the long-term, but will only be a housing option for middle- and upper-income earners. Most experts say the entire Bay Area needs to produce much more affordable and market-rate housing. Oakland's adopted budget for this year added $250,000 in local funding to expand services at homeless camps. This was an addition to $7 million in grant funding from outside sources. But city officials say that Oakland's fiscal constraints prevent them from dedicating the millions in city funds that advocates have demanded to address the homelessness crisis. Nevertheless, the city has shifted its approach to the problem over the past year. In 2016, Councilmember Lynette Gibson McElhaney led an effort to stabilize an existing homeless camp under the 580 freeway in West Oakland. Called the "Compassionate Communities" pilot program, $190,000 in city funds were dedicated for cleaning the camp and helping its residents seek transitional housing. But after a fire burned a dozen tents at the camp, the city closed it in May of last year, and the remaining residents scattered. The Oakland City Council voted last year to allow sanctioned camps, a measure that should help decriminalize the act of sleeping on public property throughout the city. And several nonprofits have been hired to offer services, including efforts to place people in transitional housing. Oakland's single officially sanctioned camp is a collection of Tuff Sheds with portable toilets and a hand washing station at 6th and Castro streets. It was opened in December and has been praised as a more realistic city-led response to the homelessness crisis. A second Tuff Shed camp is planned possibly at the Northgate Avenue camp in Uptown Oakland. Farha's impression of the Tuff Shed camp was mixed. She said that so long as it's understood to be an emergency measure with a long-term "game plan" to move people out quickly into more permanent housing, it could be helpful. "I haven't had the opportunity to hear from the mayor and assess her plan," said Farha. "But the city has an immediate obligation to get everyone into a dignified situation." Mayor Libby Schaaf has said that the Tuff Shed encampments are designed to be a temporary measure to transition homeless people into housing. On Saturday, Farha met with dozens of homeless people — many disabled, elderly, veterans, chronically ill, and suffering from addictions — and she witnessed families with children camping in the 41 degree weather. At a camp in the San Antonio neighborhood, she watched large rats scurry in the mud looking for food scraps. Several Oakland police officers arrived at dusk searching for someone among the tents and tarps. The special rapporteur was accompanied on her Oakland visit by organizers with the East Oakland Collective and The Village/Feed the People, two groups that help run homeless camps and provide clothing, food, medicine and other necessities. East Oakland Collective organizer Candice Elder said the city needs to spend more money on serving the homeless than it currently does. "The politicians are trying to make this place look like the new tech city, but we're saying this is our city and there's some really deep problems that need to be fixed right now." "I hope this visit highlights the problem as a human rights issue," said Nicholas Houston, also of the East Oakland Collective. "People see the homeless as an eyesore. They're people." "Every person I spoke to today has told me, 'we are human beings,'" said Farha about her conversations with camp residents. "But if you need to assert to a UN representative that you are a human, well, something is seriously wrong."